LeBron James leaves the media press conference after winning the 2016 NBA Championship. Victory cigars are a constant in basketball history. There was coach Red Auerbach, who strode the sidelines at Boston Garden and orchestrated nine Celtic titles in 10 years between 1957 and 1966. As games drew to a close, Auerbach lit his Hoyo de Monterrey, a ritual which signaled that the competition was cooked. Then Michael Jordan enjoyed his first cigar as a 28-year-old, waiting seven long years to light up a Hoyo de Monterrey Double Corona in celebration of the Bulls' first championship in 1991. So when LeBron James smoked a Yaxel Ortiz Y.O. Torpedo on Sunday, it topped off a grand victory. 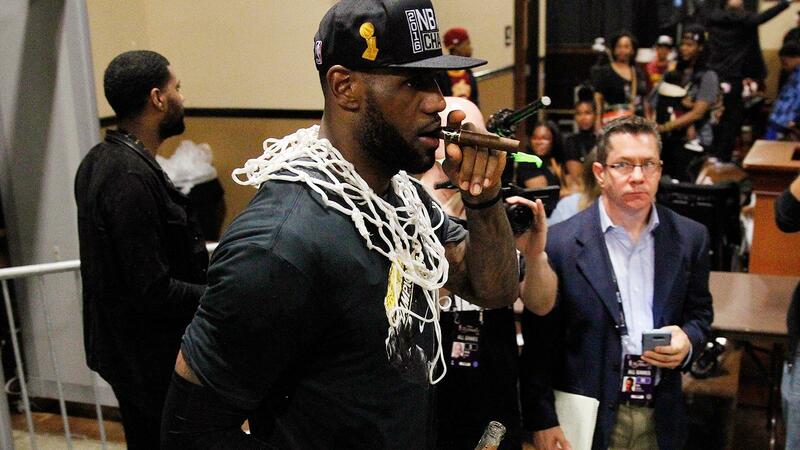 Wearing his NBA Championship t-shirt, James walked into the press conference, a net around his neck, the cigar in his mouth and a bottle of rosé Champagne in his hands. His Cleveland Cavaliers were the first team in the 70-year history of the NBA to rebound from a three-games to one deficit to win an NBA title. "I'm ready to go back to Cleveland," James said. Getting settled at the press table, he fidgeted, first taking the cigar from his mouth, then placing it on the table, then putting it back in his mouth and quickly removed it again. As James told a reporter about the tears and the emotions flooding through his mind as the game ended, his year-old daughter Zhuri grabbed for his cigar and he moved it away. "You can't have that mama," James said, with reporters laughing. "That's for daddy." James' cigar smoking traces back to his time in South Beach. In 2011, James' first year with the Heat, Miami lost to Dallas in the finals. Owner Mark Cuban smoked cigars on the plane ride home with the championship trophy in the seat next to him. But 2012 and 2013 were Miami's title years and James sampled many brands. Teammates Dwyane Wade and Chris Bosh smoked, with Bosh smoking Camachos.